Live at the Lizard Lounge, which was recorded earlier this year at a Boston-area hometown show, has an amazing soundtrack but a rather underwhelming video to accompany it. Boston’s Lake Street Dive have had an amazing year, buoyed largely by the release of their third and eponymously titled album in the fall of 2010. To capitalize on this critically lauded endeavor, the band has decided to offer to their fans not only a 52-minute live album as a digital download, but a concert video of the very same show as an extra bonus through their Web site. What’s more, the video is available either in standard format or high definition – the latter obviously meant to capitalize on those fans who want to see vocalist Rachael Price’s cute dimples as clearly as possible. All this for the princely sum of $9.99. How could you go wrong? Well, Live at the Lizard Lounge, which was recorded earlier this year at a hometown show, has an amazing soundtrack but a rather underwhelming video to accompany it. So you’d be both in the right and the wrong to pick this one up. But we should focus on the positives first. The soundtrack largely culls material from Lake Street Dive, with three choice, intriguing covers thrown into the mix: the old soul and R&B standard “This Magic Moment” (first recorded by the Drifters in 1960, but then covered by unlikely acts such as Lou Reed and the Misfits), George Michael’s “Faith” and Hall and Oates' “Rich Girl”. While the band’s recorded output leans into folk, soul and jazz territory, Live at the Lizard Lounge is a much more rocking affair, largely focusing on the guitar and trumpet finesse of Mike Olson. I’m of two minds of this shuffling of musical focus. It deters a bit from the group’s eclectic stew of various musical influences, but, at the same time, makes the material seem fresh and invigorating. It’s good to see the band not necessarily playing the same rote arrangements from their albums, which certainly makes things interesting for the listener. The live set also showcases the band playing tight and solid in front of a small but enthusiastic audience – there’s an incredible stand-up bass solo from Bridget Kearney on “Henriette” as a particular highlight – with some humorous stage banter thrown into the mix, such as Price’s insistence at the start of “Be Cool” that she knows 17 chords on the guitar. (It makes more sense and is a lot funnier when you listen to the album.) 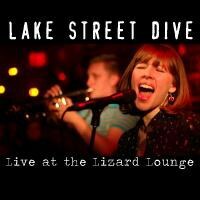 Overall, the musical end of Live at the Lizard Lounge is a great document for fans of the band, and is an agreeable point of entry for neophytes looking for a place to, pardon the pun, dive in. The video, on the other hand, isn’t much to write home about – though it certainly looks good, which might have something to do with the HD camera used to capture it as well as the use of professional-looking on-screen credits to introduce each song. Shot on a single handheld camera that softly goes in and out of focus in one loooong continuous take, much of the action is largely zeroed in on Price at the microphone. (There’s also a baffling shot of the singer’s feet at one point.) When the camera does zoom around, it usually zips away to a shot of Kearney’s right hand slapping away at her bass for an extended period of time. Boring. I realize the band probably doesn’t have the money to hire multiple cameras to cover different angles, and I suppose that any live footage of Lake Street Dive is better than no footage at all, but with the camera shakily panning at Price for much of the material that I watched, and not even a nod and a wink to the gathered crowd, things tend to get old pretty quickly. You will note that in the previous sentence I said “material that I watched”. I suppose I’ll get lambasted from fans for admitting this, but the video was such the opposite of engaging, I found myself wandering off to do different things: have a smoke, visit the bathroom, and pet my cat among other things. About halfway through, I turned the video off having had my fill. Honestly, I felt that this amazing and energetic live band deserved a lot better, and I actually prefer the amateur footage of Lake Street Dive on YouTube that at least shows the entire band, giving you the choice of shifting your eyeballs away from Price or Kearney’s slap-happy hand, if you so choose. All in all, Live at the Lizard Lounge is a great document, at least sonically, of a band that deserves to be playing larger crowds than small bars in their hometown as it effortlessly captures a band simply rocking out and having a grand ol’ time. There are few gaffs aside from Price briefly stumbling over the lyrics to “Faith” and the album carries forward the momentum generated by Lake Street Dive, showing exactly what the band is capable of outside of a studio setting. Lake Street Dive is a band clearly going places, but let’s just hope that, for future concert footage, the group can gather up a better camera crew to document their acumen at playing songs full of lots of heart on stage.